An addictive and fun mobile game based on the movie Delhi Belly.Your objective is to capture the precious treasure hidden inside a Russian Doll by transporting it safely to your friends at the top of the map without dropping it. 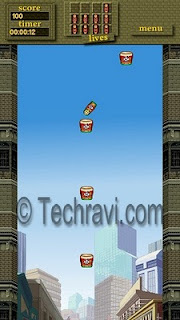 It is a very funny game, inspired from game "Eggs" which i played in year 2005 in my Nokia 6630. Download it from the link below. This film was a blockbuster .The film opened very well at the box office. It collected around INR36 crore in first week of screening all around India and US$ 1.6 million (INR7.25 crore) overseas. The film collected INR55 crore nett gross in India by the end of its third week, being declared a super hit.Delhi Belly grossed INR89.50 Crore worldwide.